It is said that the root of TLR camera is such a two-store-house camera as shown in the left figure. This is the camera called “Reporter” manufactured in London in 1872 which is about one hundred thirty years ago. In those days, it took unbelievable time to take one shot with a primitive camera as you had to locate subject through the focusing screen, focus it, slide in the film, pull off the dark slide, and release the shutter. And also taking unstable subject on a picture was extraordinary hard. Then, this camera was developed to make a breakthrough in some of those condition – omit the procedures of “slide in the film” and “pull of the dark slide”. Although Reporter had not incorporated the mirror yet, it wasn’t long before the camera took its shape into a general TLR camera. Around 1880, a staff of the meteorological observatory near London came up with the idea to build the mirror inside the camera to take a picture of cloud. That was when the camera employed the mirror in it for the first time. Well, it is certainly effective because you just see forward to catch cloud above in the focusing screen. This camera, therefore, was called “Cloud Camera”. On this camera, two lenses were coupled with gear in the middle which syncronized the lense’ movement with the other, and the image on the focsuing screen standed up thanks to the mirror (before that, the image was up side down). This have been thought the direct root of TLR camera now. But, there were still problems. One of them was that the camera was big, and not practical for that reason. And also, it was not for close photography because of parallax. Around 1840, Daguerreotype had started to be manufactured in New York. Then, as the large-size TLR camera appeared in Europe, it was exported to America little by little, and around 1900, manufacturing was started there, too. 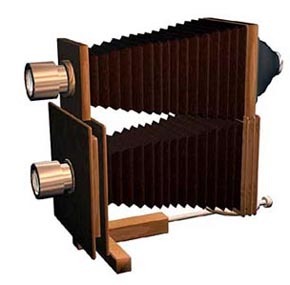 Twin-Lens Graphics Special, released in 1901, looked like a TLR camera, but it was not exactly Reflex camera, for the focusing screen was put on the camera back. 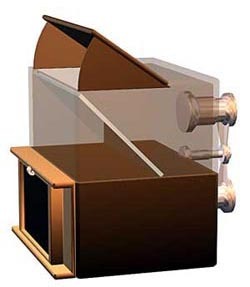 On Twin-Lens Graphics, location of the focusing screen was changed for the camera to be a TLR. 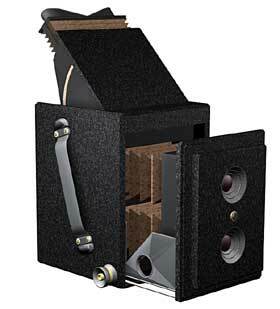 In addition, Twin-Lens Graphics was a forerunner to the Graflex SLR camera. via History of the TLR camera 1.